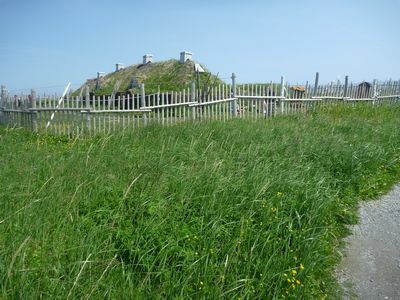 In July of 2012, the Dark Ages Recreation Company (DARC) returned to L'Anse aux Meadows. Apparently, they liked us so much in 2010, that they wanted us to come back! Unlike previous years we (Neil and Karen) were pretty tight on time, and Neil had been having a stressful year at work. 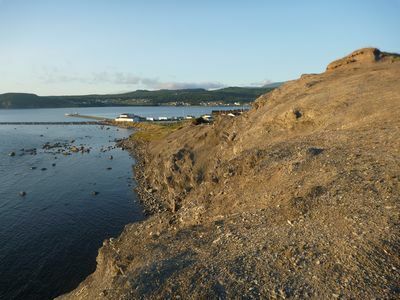 This time we flew into Deer Lake, spent a long weekend in Gros Morne and then headed up to L'Anse aux Meadows, Newfoundland, Canada -- the only verified landing site on North America for the Norse during the Viking Era. Overall, it was an excellent choice. The weekend was a lot of fun and very relaxing, putting us in good shape for the joys and stresses of working with the tourists who come to the site. Sadly, we didn't take as many pictures or notes about this trip but we'll provide what we can. We have travelled enough now that the Airways Transit to Toronto, then hopping on a plane and flying out is pretty normal to us. In this case, Air Canada took us out east. After a reasonable flight we landed, deplaned, picked up the rental car. All very simple. We'd planned on dinner at this point but since we weren't actually hungry we decided to just drive up to Rocky Harbour. It is actually a fun little run and driving through the curves in Gros Morne is always nice - just not as scary as I remember from back in 2000. We found our place at the Gros Morne Suites - a nice one floor, one bedroom apartment with another apartment above it. We walked down the road to Earle's Mug Up, had a nice supper, picked up some supplies and went back to the room to crash. Woke up and spent some mellow time out on the porch just enjoying the wind, sun, and sea air. Both of us dearly love being able to spend time close to the big water. We spent Saturday walking around town and hitting the Salmon Point Trail. 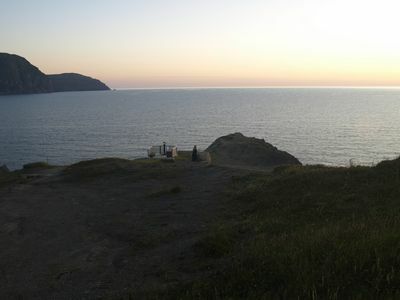 We went up there during the day and returned after dinner to see the sunset which was well worth it. The daylight shot shows the fish plant that was visible from our porch while the sunset is looking out from the lookout. Lunch was at the Sunset Restaurant which was OK but nothing special. Dinner was at Java Jack's. Wow. Neil's facebook for that meal said "Bubbly bake - lots of seafood in a vichyssoise covered in cheese and baked, followed by partridgeberry (lingonberry) creamcheese poundcake. 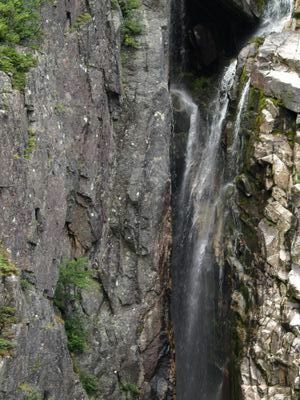 Good thing Gros Morne has lots of hiking trails to work this food off." Another wonderfully sunny day allowed us to do two hikes. The easy one was the Lighthouse at Lobster Cove Head. Nice trails in a variety of levels and a nice little museum in the lighthouse. 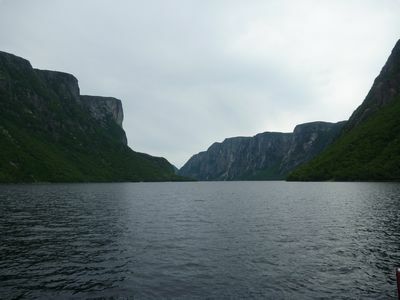 The afternoon was spent doing the Western Brook Pond hike and boat tour. A couple of kilometers along a trail through wetlands into the lake, then a three-hour cruise, and walk back along the boardwalk to the car. Fun. Western Brook Pond is a fjord that is closed off. Long, thin, lovely slopes up from the water. Well worth the walk (which is fun itself). Lunch was at the pub in the Ocean View Hotel - quiet nice. We returned to the restaurant upstairs for supper which was very good. Monday was rain day. Its not like you can expect every day in Newfoundland to be bright and sunny. 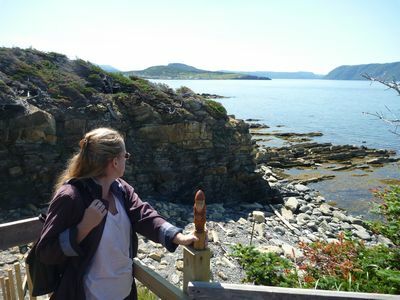 Instead of going for a hike we stuck to inside activities including a trip to the Bonne Bay Marine Station. A small station but staffed by very knowledgable and engaged people. Some nice displays, and good access to the holding stations used by the research. We also stopped at a small crafts store in town which was fun. Then back to the room to relax. 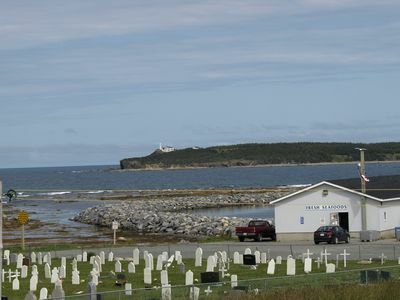 The four hour run up from Rocky Harbour to L'Anse aux Meadows is a peaceful drive with some very boring stretches and some interesting points to stop and visit. This time around we chose to stop at the Arches park. A nice little break. Also did the obligatory stops at Dark Tickle, and Stagehead Carvings before arriving at Southwest Pond Cabins - and headed over to Northern Delight for dinner. Neil had the partridge berry cheesecake - he misses it when he's not there. Check-in day for the crew. The rest of the team had arrived last night so we did the usual run around. Unloading the gear, meeting with the staff to make sure of all of the details and any last minute changes. Shopping for last minute items like heavy rain wear (nasty weather today). This was the main point of the trip. We were working on site with the Parks Canada staff. There were a number of activities planned in addition to the usual interpretative ones. Karen presented twice on textile topics. Neil provided a lecture on pastimes, and two displays on the bead making technologies. We were also given permission to grab a couple of small samples of bog iron off the creek for testing. The non-invasive way to do that is to use the cut the creek makes to get to the depth required and pry a couple of small pieces out of the bank. Here's a photo of Darrell hard at work. Neil also did a one-day exchange tour over at Norstead, talking content and presentation technique with the folks working there. That is a fun way to spend a day. Mostly the same tourists - only less of them, but talking with a different group of staff members with different training. The last day we took a moment away from the work with the tourists to do something we didn't get the chance for the last time. Norse washing-day. 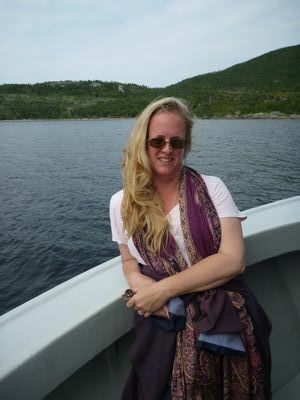 A quick dip (in Norse clothing) into the North Atlantic, then a clean up in the fresh water of the creek. We snuck in a day off, sadly a windy, rainy, blowy day - so we didn't go out with Northland Discovery boat tours. Some of our DARC mates had better luck on their day off and got to see whales right up close. We did run into St. Anthony for a little shopping and to grab lunch at the Lightkeeper's Cafe before heading back to dinner with the group. There are more photos on the DARC Blog. Not much to write about for today. 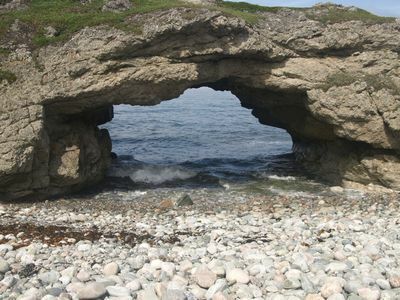 Hop in the car and tear down to Rocky Harbour to grab lunch with the group at Java Jack's. Then down to Deer Lake. We arrived early enough that we could spend a little time at the Insectarium before heading to the airport for the flight home. Mostly a working vacation but still nice to get a couple of extra days on a wonderful island, seeing old friends, and making new ones. 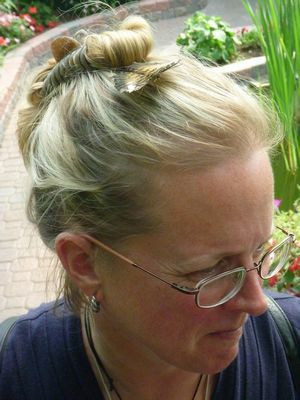 Karen wasn't at all sure about this butterfly that landed on her head - the feel of it's feet was very creepy.